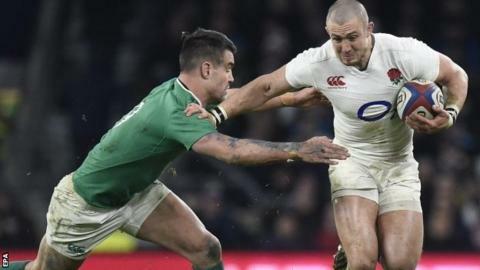 England full-back Mike Brown is available to face Wales in the Six Nations after it was decided not to cite him for his boot to the head of Ireland scrum-half Conor Murray. Murray needed stitches to a wound in his head, which was sustained when Brown attempted to kick the ball from his hands during England's 21-10 win. The incident was reviewed at the time on the big screen by referee Romain Poite, who took no action, and the citing commissioner has decided no further action is needed. England have won all three of their Six Nations games so far and play Wales at Twickenham on Saturday 12 March. Coach Eddie Jones said after the win over Ireland that Brown, who scored a try in the second half, had done nothing wrong. "The referee adjudicated on it. It was fair. If the ball is on the ground then you are allowed to kick it, aren't you?" Jones said. But former Ireland captain Keith Wood felt that Brown should have been cited for dangerous play. Speaking on Sunday night Wood told BBC Sport: "You have to be careful what you are doing with your feet. Brown kicks through Murray, he kicks him in the face and he will be cited, he has to be cited. "You are allowed to use your foot in a ruck but he is at the side of his head. He had both feet flaying at it. I hope a precedent is set where you can't kick from the back through a player who is holding the ball."